A rule change ahead of the 1993 season, banning Group C prototypes, had temporarily halted Toyota's long-running sports car program. The much desired victory in the 24 Hours of Le Mans had not yet been scored, so a return was always on the books. A tweak in the GT1 class homologation requirements for 1998 offered Toyota a path back to Le Mans without the hassle of constructing and selling 25 road going examples; only a single street legal copy would now suffice. As had become common practice with World Rally Car and Group C programs, the design and development work would be shared by Toyota in Japan and the Cologne, Germany based Toyota Motorsport GmbH (TMG) subsidiary. With an engine readily available from the earlier Group C program, most of the workload in this project fell on the 'German' shoulders. They were tasked with the development of a brand new sports racer, which due to the subtle rule changes would become the most extreme GT1 car yet. 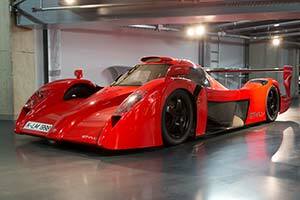 Known internally as the TS020, the new Toyota racer was more commonly referred to as the GT-One. The car was built around a carbon-fibre monocoque with an aluminium honeycomb core, which used the engine as a stressed member. While the chassis was designed by TMG, it was actually manufactured by specialists Dallara in Italy. The suspension was by double wishbones with push-rod actuated springs and dampers on all four corners. Carbon-ceramic brakes were also used all around.